Raynaud’s phenomenon describes a condition where the digits of the hands as well as the feet undergo a change in color often accompanied by pain, numbness and/or tingling. 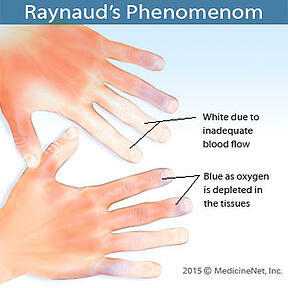 Raynaud’s is often classified as either primary (Raynaud’s disease) or secondary (Raynaud’s phenomenon). Primary Raynaud’s occurs in the absence of any other associated disorder whereas secondary Raynaud’s occurs in the setting of autoimmune connective tissue disorders (CTD), most often systemic lupus erythematosus (SLE) and scleroderma although it can be associated with any CTD including Sjögren’s. Primary Raynaud’s occurs most often in women between the ages of 15-30. There is often a family history of Raynaud’s. Raynaud’s is caused by constriction of small blood vessels in the fingers, toes and occasionally other sites including the tip of the nose and the ears. This is also known as vasospasm. Raynaud’s most often occurs in discrete episodes triggered most often by exposure to the cold but also by emotion (fear, anger, excitement) and by certain pharmacologic agents including nicotine and certain medications. Raynaud’s is most often reversible; when the inciting stimulus is removed, the episode resolves. Clinicians classically refer to Raynaud’s episodes as “tri-phasic”. This means that the color change proceeds in 3 distinct phases – white, which represents pallor of the digits when blood flow is reduced secondary to the vasospasm; blue/purple, when the blood pools in the veins, and red, where blood flow is temporarily enhanced at the conclusion of the episode. In addition to the association with autoimmune CTD, secondary Raynaud’s can rarely be associated with sludging of blood in capillaries caused by high protein levels seen in hematologic disorders as well as by vascular diseases such as atherosclerosis. Thus, when evaluating a patient presenting with possible Raynaud’s, the clinician needs to distinguish primary from secondary Raynaud’s. This mainly involves determining whether or not the patient has an autoimmune CTD by clinical exam and lab testing. In addition, a simple test where the capillaries of the nail beds of the fingers are examined using a hand held illuminated magnifying lens is often performed. The finding of irregular, dilated nailbed capillaries is strongly suggestive of an underlying CTD. Since the vast majority of Raynaud’s episodes are triggered by cold exposure, mitigating the effects of reduced temperatures is a very important component of Raynaud’s management. It is important to realize that a significant portion of Raynaud’s pathogenesis is a reflex involving sympathetic nervous system control of blood vessel contraction. Thus, once the cold-induced reflex occurs, the episode will progress. Therefore prevention of this cold-induced reflex is extremely important especially in colder climates or as cold weather approaches. Patients are advised to dress warmly especially regarding the extremities. Mittens are felt to be superior to gloves since they encourage contact warmth between the digits. Gloves/mittens designed for skiers contain chemical or electric heating elements and may be helpful for certain patients. Emphasis should be placed on donning cold-weather gear prior to leaving the home. It is felt that lowering of core body temperature plays a role in triggering Raynaud’s episodes. Therefore, cold-weather clothing should minimize heat loss and include hats, scarves woolen face masks, and the use of layers. Since Raynaud’s episodes are reversible, return to a warm environment usually results in resolution of the episode. If a digit remains painful or is persistently pale or blue, then immediate medical attention should be sought. When episodes are frequent or prolonged, pharmacologic therapy should be used. Medications used to treat Raynaud’s include those that dilate blood vessels and such as drugs used to treat hypertension (calcium channel blockers, ACE inhibitors and angiotensin receptor blockers). Pulmonary hypertension medications including sildenafil (Viagra; Revatio) can also be helpful. by Steven E. Carsons, M.D.